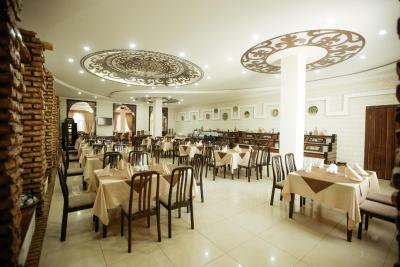 Lock in a great price for Hotel Asia Khiva – rated 8.1 by recent guests! Just across the street from the South Gate of old city. My room had a spectacular view of the city wall and gate. Staff were extremely helpful and friendly. My departing flight was late at night, so they let me keep the room later for no charge. Perfect location across the street from the old city. I would rather have a modern hotel across the street, than a "rustic" hotel inside of the city wall. Very clean. Airport transfer service was quick and comfortable. We booked this hotel because of its swimming pool. On the plus side, we found the rooms to be quiet, the beds and AC to be excellent and the bottles of water in the room were a nice touch. 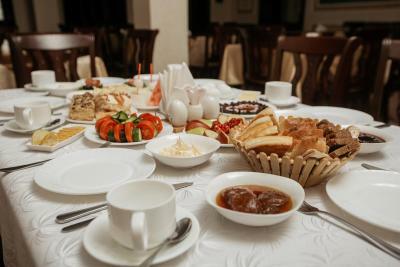 The breakfast was pretty good as well. Nice hotel, clean and new. Air conditioning worked well even in such a big room. Staff was very friendly and allowed a later check out without any fuss. Old city is just across the street. Very reasonably priced. Excellent location. Friendly and helpful staff at the reception and the breakfast room. Got me a nice car not too expensive for Bukhara. Extremely helpful and probably with the most English speaking front desk staff, accommodating, good tips on where to eat and what to do, spacious room, nice beds and comfort. Our flight was really late on the day we check out, it was low season and they were so kind to hold the room at no extra charge until evening Very appreciative of the extra miles they put in to ensure we are comfortable. 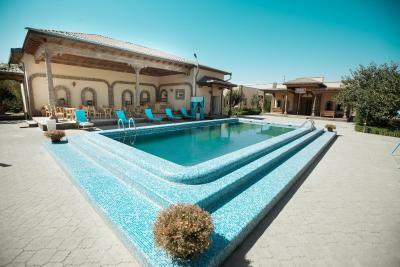 perfect location facing the khiva gate, easy access. 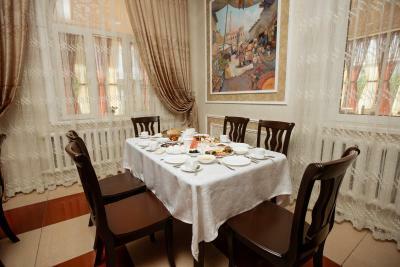 Good location - just a few minutes walk to the major sights of Khiva. Functional clean hotel. 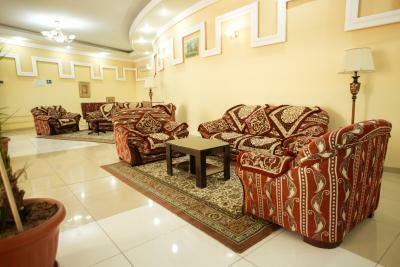 Hotel is excellent for visiting Khiva. The manager made everything possible to make our stay as comfortable as possible. Airport transports can be arranged and helpful advices are given. Pool and general hotel appearance is superior. Special towels are available at the pool. Rooms are large and keep cool even without running the AC all day. Breakfast is very rich. Lovely swimming pool area (this was the main reason for choosing this hotel), well located, friendly staff, room with a lot of space. the staff was very friendly and helpful! 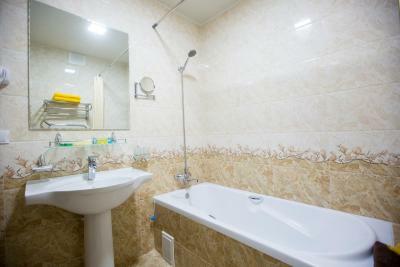 rooms are big, not noisy and very clean, the aircondition works well. the position of the Hotel is perfect to visit Chiva. Breakfast was good and the staff is flexible and very friendly! All in all I can really recommend this Hotel. 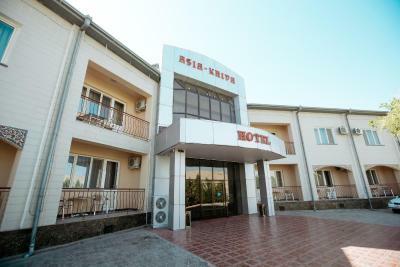 Hotel Asia Khiva This rating is a reflection of how the property compares to the industry standard when it comes to price, facilities and services available. It's based on a self-evaluation by the property. Use this rating to help choose your stay! 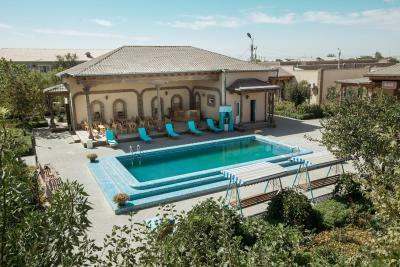 Located in the historical town of Khiwa, less than a 1-minute walk from the Ichan-Qala - Tash-Darwaza Gate and the old city, Hotel Asia Khiva features a spa and wellness center, a swimming pool, a sauna, and an on-site restaurant. The modern rooms here feature an electric kettle, a TV with satellite channels, air conditioning, and a private bathroom with a bath or shower. Other hotel facilities include a fitness center, a bar, a 24-hour front desk, a business center, meeting or banquet facilities, and a concierge service. Urgench International Airport is 25 mi away. 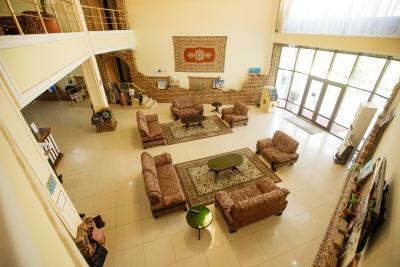 When would you like to stay at Hotel Asia Khiva? This modern room decorated in neutral colors features an electric kettle, a TV with satellite channels, air conditioning, and a private bathroom with a bath or shower. This spacious, modern suite decorated in neutral colors features an electric kettle, a TV with satellite channels, air conditioning, and a private bathroom with a bath or shower. Extras include a seating area with a sofa. 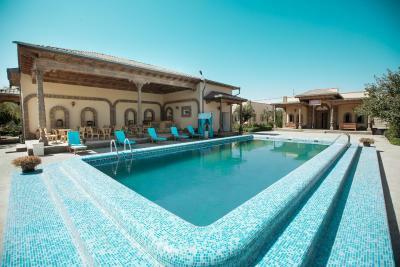 House Rules Hotel Asia Khiva takes special requests – add in the next step! 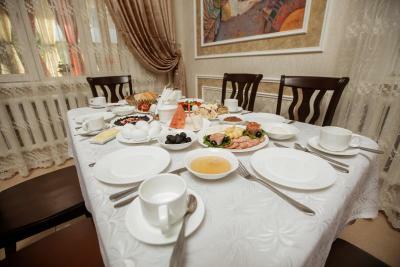 Please note that the hotel does not accommodations non-married Uzbek couples. 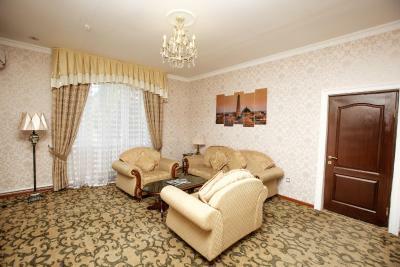 All Uzbek couples must present a valid marriage certificate upon check in. 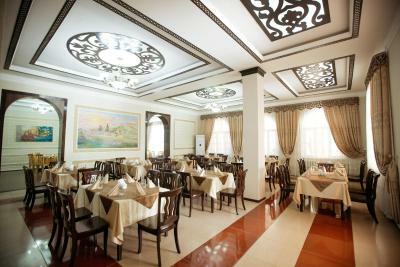 Please inform Hotel Asia Khiva of your expected arrival time in advance. You can use the Special Requests box when booking, or contact the property directly using the contact details in your confirmation. Wifi connection in the room was quite poor. No WiFi in my room. They are working on the problem. My main complaint is that this hotel is substantially over-priced. Located just outside the old city’s southern gate, the location is decent but does not compare with the much better location of other hotels in the same range. Finally an observation: the choice of colour for bathroom towels and bedding is bold to say the least. I wasn't able to have dinner because of a wedding reception. There was not much open in town. Perhaps I could have ordered room service. In any case, nothing to blame them for. wifi is limited to lobby only. became a problem for us, family skype calls at different timezone, we also needed to plan/discuss/research/make credit card payments on travel plans, no privacy or comfort to complete it in room, had to walk in and out to the lobby. For breakfast, would recommend to add a bread toaster it would make a huge difference with a warm toast in the cold winter months. Our experience of the a la carte food in the hotel was not good - expensive and not good quality - we ate there on the first night as it was late when we arrived. There are better quality restaurants within 5/10 minutes walk of the hotel. The front office staff could have been more helpful and alert - forgot our wake up call? WiFi signal is available in the lobby. Hotel for travel agencies groups. Poorly trained staff. It seems that the only important thing was to charge an unreasonable price for anything. Wi-fi only in the lobby, the only hotel with this poor wifi in a twelve-days trip in Uzbekistan and it was the most expensive of all. Meals and extra services (transfer from airport, etc...) are too expensive, poor dinning in room service. Wifi works well but only in reception. Very comfortable bed, extra pillows. 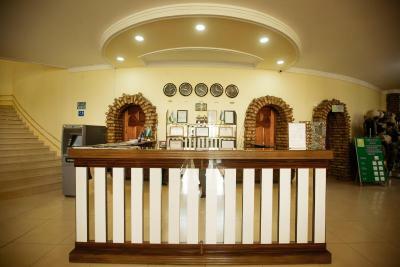 The hotel has nice inner yard and and the personnel is very friendly.